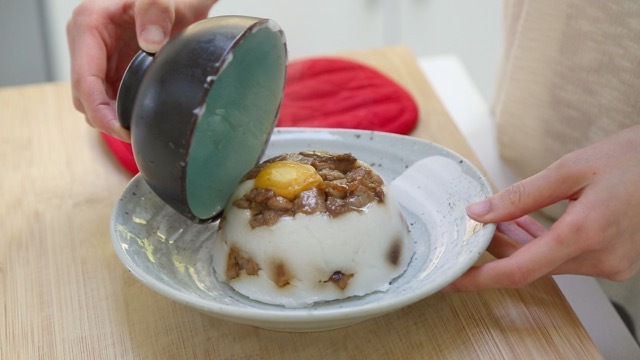 Taiwanese Rice Bowl Cakes are a very traditional homestyle snack or light meal. 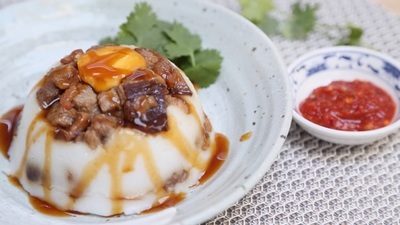 It's made up of plain tasting "rice cakes" which is basically steamed rice paste (rice flour + water) and is usually topped with savory pieces of meat, shiitake mushrooms and salted duck egg yolk. Even though it's a traditional Taiwanese dish, I don't think it's very popular like Taiwanese Beef Noodle Soup or Three Cup Chicken, as I rarely see this dish served at Taiwanese Restaurants in the US. They mainly sell these bites at Taiwanese Night Markets or sometimes if you're lucky, from daytime side street food vendors. How's the taste? I was actually really happy at how these turned out the first time I cooked them. They're so much better than I remember when I had them last at the night markets. : ) So I highly recommend trying this, especially if you like Turnip Cakes. 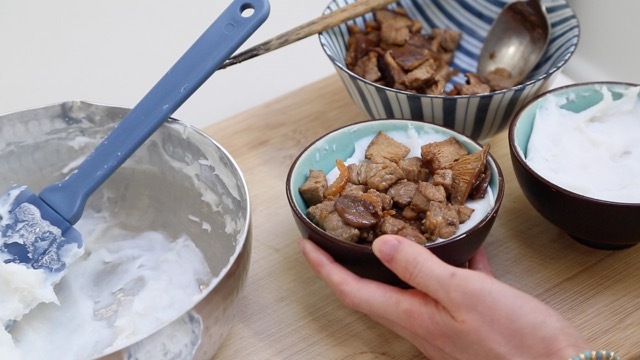 Tip: Personal preference ~ I actually like my Rice Bowl Cakes (the white parts) to be a bit on the softer side, so my recipe's ingredients reflect this below. If you'd like it firmer, you can use 1 cup of hot water instead of 1 1/4 cups, and/or replace the tapioca flour with cornstarch (1 - 2 Tablespoons). Ready in Total Time: 1 hr. 10 min. Cook Time = 55 min. 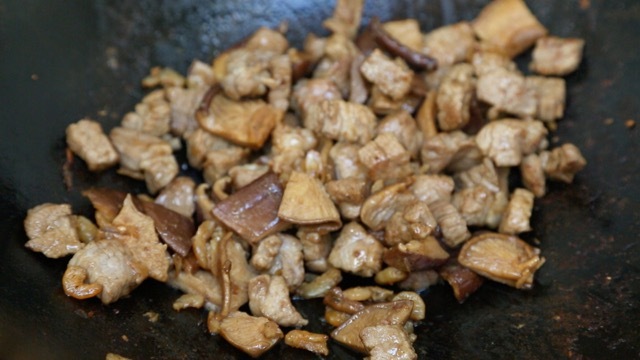 Cook the ingredients for the toppings first. Mix and cook the rice flour paste. Assemble the bowls and steam for approx. 45 minutes, or until the rice cakes have set. Let the bowls cool for a few minutes before serving (this will also help set the rice cakes).